This is as close to being “won over” as I can get Geralt to look. Last week, I asked for your advice for finishing The Witcher 3. You had some great, if not sometimes intimidating, tips. This weekend I took some of that advice, and now I’m here to say: oh my god you guys Witcher 3. Reading through your comments, I was happy to see I wasn’t alone in being cowed by the size of The Witcher 3. You all had some excellent and thoughtful advice, from setting the difficulty to easy, doing what comes naturally, not being a completionist, treating it more like a TV show, or just getting so wrapped up in the story you can’t help but keep playing. It was a great discussion, so check it out if you’re looking for inspiration. Here’s what I eventually decided to do: Over the long weekend, I vowed that I would only play The Witcher 3. On Saturday, when my roommate asked me to play Overwatch with her, I stonily replied, “Witcher 3...” She was confused and possibly disturbed. I brewed some coffee and plopped down in front of my PC. I heard my roommate laughing with our mutual friends on Overwatch’s voice chat. I closed my door with determination. I’d left off at the beginning of “The Ladies of the Wood” quest, which at the time meant I found Geralt (sans Roach) standing in the middle of a swamp being asked to use his Witcher Senses, a command I couldn’t remember how to execute. I fumbled my way back to a town and spent some time relearning the controls and the systems. I looked through all the useless garbage in my pockets, none of which I needed to craft the recipes I had at my disposal. I re-read the character guides, the heaps and heaps of quests I was under-levelled for, and some of the tutorials. I Googled alchemy, and armor, and how to put points into Geralt. The game started coming back to me. I chose a low level Witcher contract at random and set out to do it. The world of the Witcher 3 is huge and busy, with question marks and treasure hunts and people in distress everywhere. One thing led to another, and then another, and then another. Without the temptation (or the pressure) to play another game, I just kept going. It was a bit like being a kid again, when I only had the one or two games I could beg my parents for. 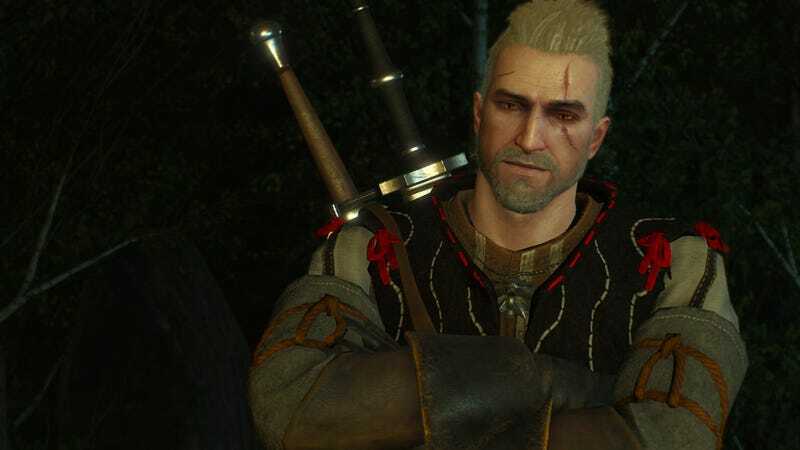 If I didn’t like what I was doing in The Witcher 3, I looked for something else in the game to do instead of switching to another game—but I quickly ran out of things I didn’t like doing. Most of Saturday passed before I realized I hadn’t even gone back to “Ladies of the Wood.” In fact, I was on the complete other side of the map, knee-deep in tasks and adventures. While waiting for the subway Sunday morning I pulled out my phone to play a round of Threes and then promptly put it back in my pocket, recalling my vow: no other games. As I stood on the platform without a phone game to entertain me, my thoughts drifted to what I wanted to do in The Witcher 3 that day. I started making a plan for tackling the story. I Googled up some more tips and some armor guides and the answers to a couple technical questions I was struggling with. And then I went home and played the whole rest of the day, ignoring that plan completely because I got caught up. I finished the Witches’ quest Sunday night, closing out the Bloody Baron’s storyline with a lot of, shall we say, feelings. A lot of you mentioned the Witches being the place where you got hooked. Me too. Those witches were creepy as hell, and as soon as their storyline ended I couldn’t wait for another one. I played until 2am, woke up at 10 Monday morning, and immediately booted up the game again. It was the last day of my long weekend and damned if I wasn’t going to Witcher my brains out. My roommate told me the weekend was technically over since it was Monday and I could stop playing The Witcher 3 if I wanted. I closed the door on her. Most of my screenshots of Geralt look like this. I’m sorry. I’m pretty sure I won’t finish this game any time soon, but I’ve decided that’s OK. I’m sorry if I ever doubted you, Kotaku readers and colleagues alike. This game is rad as hell. I’m nowhere near done, but I already don’t want it to end.